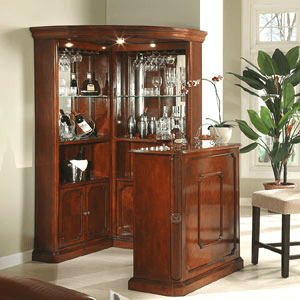 Classical Corner Bar Set Bar Stand 3-Pc Corner Wall Unit Featuring Rich Cherry Wood Veneer with Decorative Molding, Wine and Glass Shelves, Door Cabinets, Ceiling with Light - in Warm Cherry Wood Finish. Price includes Corner Wine Cabinet only. The Bar Stand as shown is not included in the price but can be purchase seperately below.. Easy to assemble. Strong Construction. Pieces can be purchase separately. Bar Stand - Has shelve - x cubbies for wine bottles - place to hang wine glasses. Bar Wall Unit - Has (1) glass shelve - double doors with wood shelve. Made of wood and wood veneer.